Dophin's and Manatee are plentiful and although they are frequently seen in the Bimini canal behind Bayside Villa its more fun to interact with them out on the water. Dolphin's love to play and ride along with the boat, both in the bow wake and behind the boat in it's wake. The Dolphin Encounter Video was taken in September 2010. After boating and interacting with the Dolphin's at Picnic Island, a nearby destination to Bayside, a large pod of Dolphins followed the boat nearly all the way back to Bayside. 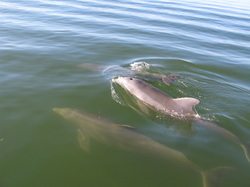 Every time Dolpins were encountered in the inter coastal waterway while traveling back to Bayside, they would join in with their friends. It's not uncommon to have Dolphin's leading or following the boat, but having a large pod of Dolphin's all at the same time was quite exciting.